Oceanwide Expeditions' new 3,434-ton 110-berth polar vessel Plancius was named at Vlissingen, the company's home base, on November 14. Sponsored by Carla Peijs, Queen's Commissioner for the Province of Zeeland, she is now on her way to Ushuaia, where she will undertake her maiden Antarctic voyage on January 8, 2010. Oceanwide made the news twice that week as it was simultaneously named the "World's Leading Polar Expedition Company 2009" at London's World Travel Market. Oceanwide will operate the Plancius together with 1,753-ton 50-berth Professor Molchanov and Professor Multanovskiy during the Antarctic season. Among them, these three ships will offer more than 30 Antarctic departures over the 2009/10 season. 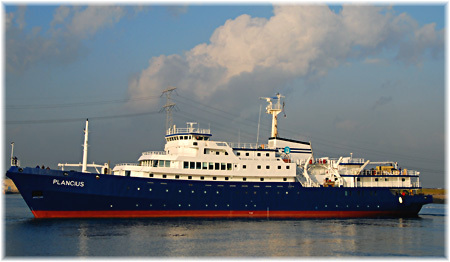 Built in 1976 as the Royal Dutch Navy's oceanographic research ship Tydeman, the Plancius has been totally rebuilt over the past two and a half years into a top-notch ice-class passenger vessel capable of operating in polar regions. 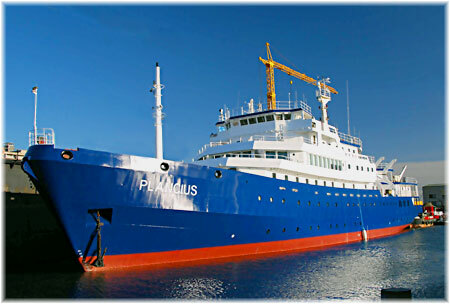 Being a former oceanographic ship, the Plancius has attractive hull lines and it is also obvious that much thought has been put into her new internal layout. She will be staffed by an experienced Russian crew recruited from the Professor Molchanov and Professor Multanovskiy, which Oceanwide has been operating on charter for many years, while the expedition team and hotel manager are from Oceanwide's own experienced personnel. Forward of the main lounge is an accessible open deck area and from here passengers can reach the bow. Passengers are also allowed onto the bridge, where views are possible in most directions, although the forward view is obscured somewhat by the layout of navigation instruments and controls that cover the lower window area, but there are better views from the open bridge wings. Both lounge and dining room double as lecture halls when it comes time to learn about wildlife, geology, Antarctic base camps and local history. And off her main lounge is a library stocked with various reference materials. The ship's decor is pleasing, with grey leatherette banquettes featuring in both lounge and restaurants while the ship is carpeted throughout in blue. Companionway bulkheads are decorated with very good still wildlfie photography. Deck 3 outside is laid with teak and contains an embarkation area and zodiac boarding area on the starboard side while the port side contains the ship's galley. Aft there is a rather attractive teak-laid barbecue area with views over the stern. The upper decks are quite extensive and on certain decks it is possible to walk completely round the superstructure, making for superb viewing of wildlife and scenery. The new ship's cabins have been simplifed into three basic types of accommodation, all en suite. Ten superior cabins located on the top two decks, 5 and 6, contain double beds, and thirty-nine twin cabins on decks 2, 3 and 4 contain twin beds, while four triple cabins have an additional third, upper, berth and are located on the lowest deck, 2. In addition to the double bed, the superior cabins feature a sofa and double windows. The Plancius has some magnificent viewing areas compared with some of the vessels that have sailed Antarctic and polar waters before her. One of the first things that one notices on touring the ship is the excellent views that can be had not only from her main observation lounge, forward on deck 5, but also from the windows either side of her dining room aft on deck 3 and from the outside decks.